Join the cigar community and checkin and rate the cigars that you smoke. See top rated and trending cigars and get great ideas of new cigars to try. The websites creator or author is Awerest - interactive studio. 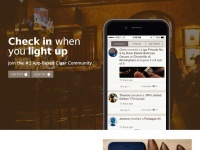 The web server used by Cigarapp.co is located in San Francisco, USA and is run by Fastly. There are many websites run by this web server. The operator uses this server for many hosting clients. In total there are at least 129 websites on this server. The language of these websites is mostly english.